With over 90,000 practicing RNs, Michigan has the eighth-largest nurse workforce in the country. But with 38 percent of them above the age of 54, and 43 percent planning on retiring by 2025, according to the Michigan Center for Nursing, the state needs plenty of new graduates to replace them. Advanced practice nurses are needed too and the number of students in MSN and doctorate programs has all increased over the past 10 years. This comprehensive guide compares nursing schools in Michigan, explains the steps to licensure, and gives prospective students an idea of what to expect in terms of salary. The Michigan Board of Nursing approves both undergraduate and graduate nursing programs in the state. 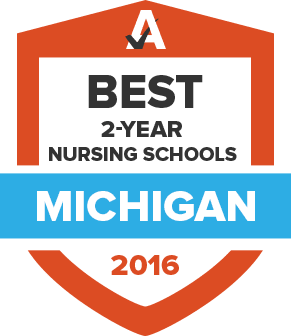 Use the search tool below to explore community colleges, private technical schools and universities in Michigan with accredited nursing programs. In order to earn a professional license in Michigan, nurses must adhere to the standards set forth by the Michigan Board of Nursing. This agency is responsible for regulating nursing school programs, investigating professional infractions, and revoking licenses when necessary. Initial RN licenses are only good for four months to one year, depending on when they are granted. During this initial licensure period, no continuing education is required. After that, licenses must be renewed every two years at a cost of $74. Over the course of those two years, RNs must complete 25 contact hours of continuing education, one hour of which must be in pain and pain symptom management. For more information about licensing, including details on nurses with special circumstances, visit the Michigan Department of Licensing and Regulatory Affairs. The number of available nursing jobs in the US is expected to increase 16 percent from 2014 to 2024, according to the Bureau of Labor Statistics. Half of that growth will be generated by just ten states, one of which is Michigan. The advanced practice nursing areas are also expected to expand in the state at a steady pace, growing by more than 11 percent in just a decade. To get in-depth data on what Michigan pays its sizable nursing workforce, check the figures below. By its own count, MANA represents 2,300 nurse anesthetists and students. It runs both a scholarship fund to grow the profession and a political action committee to finance lawmakers’ campaigns. The Michigan Association of School Nurses works to advance the school nursing profession and protect the health and well being of Michigan’s school children. Nursing students and recent graduates can use the association’s website to search for jobs, while school nursing veterans can network and get involved in MASN’s advocacy campaigns. The Michigan Board of Nursing is the state’s licensing body for the profession. Its website is designed to convey everything students, recent graduates and practicing nurses need to know about the licensure process. With five regional chapters, the Michigan Emergency Nurses Association has acted as the voice of emergency nurses in the state since 1985. Its national organization is the Emergency Nurses Association, which has nearly 40,000 members across the U.S. The Michigan Nurses Association addresses the professional and political issues registered nurses face in the state. As a union, it protects workers’ rights and advocates the state legislature for pro-nursing policies. The Michigan Nursing Students Association provides a strong professional community for those studying nursing. It offers multiple scholarships each year, which are awarded at its annual convention.